Leslie Korkgy-Valenti will coach a 12U team at the USA Softball Hall of Fame Stadium, the same place where the College Softball World Series is played, in Oklahoma City, OK this coming June. LODI – When former Leonia High School and Muhlenberg College star Leslie Korkgy-Valenti finished her professional playing career internationally she wondered just how and where her life-long softball odyssey would take her. There have been many twists and turns throughout her professional career and her life in softball. Throughout the past 20-plus years she has developed into a figure that is revered in softball circles not just locally, but nationally as well. 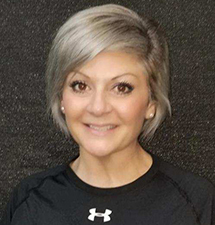 Recently, Korkgy-Valenti was selected to coach one of the Northeast Regional teams for the USA 12U Softball All-American Games sanctioned by the ASA. The games will be played at the USA Softball Hall of Fame Stadium, the same place where the College Softball World Series is played, in Oklahoma City, OK this coming June. Having been in and around softball since fourth grade, Korkgy-Valenti forged many relationships along the way from her days at Leonia through her time at Muhlenberg, where she eventually got involved with one-on-one instruction. Among her many friends in the game and one of her best is current East Stroudsburg University head coach Jamie Wohlbach. Currently, Korkgy-Valenti is the founder of AllStarz Baseball & Softball practice facility in Lodi. Along with the private instruction that Korkgy-Valenti provides, the facility features the PX2 ProSimulator that is used by a slew of Major League baseball players both as a batting machine as well as being used for defensive drills. The other feature at AllStarz is the StrikeOut Pro. A machine that simulates a batter being in the batter’s box with ‘hot zones’ along with each pitch and location being charted on a tablet. It can even set up a simulated game against a particular batting order. Korkgy-Valenti’s path has led her all over the world for softball and will lead to Oklahoma City from June 8th-10th. There will be three teams representing the Northeast Region with Korkgy-Valenti at the helm of one of those squads, who will play at least four games. She knows it is an once-in-a-lifetime opportunity and is prepared to enjoy every second of her time there.